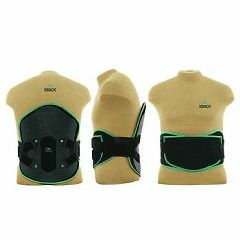 AllegroMedical.com offers The XBACK Solution ES Back Brace. Lumbosacral orthosis (LSO) back brace provides coverage from the sacrococcygeal junction through the T-9 vertebra. Offers even pressure distribution and consistent pain relief for treatment of arthritis, herniated disks, mechanical lower back pain, and more. Designed with special heat moldable panels that can be easily fit to any patient in just one session. Easy for patients to take on and off with comfortable, lightweight braces that encourage compliance with treatment protocols. Developed with dynamic force technology offering constant compression and support without sacrificing comfort. The brace stays in constant contact with patient's body and every patient-facing surface features specially designed moisture-wicking materials to maximize comfort. Features a special ergonomic design to promote a better fit and a special anatoical curve follows the patient's body to prevent the common problem of riding up. Xback braces are suitable for treating a wide variety of diagnoses, including back pain, scoliosis, arthritis, kyphosis, and more. T105L - Large Waist Size 35-42"
T105XL - X-Large Waist Size 43-47"
T105XXL - 2X-Large Waist Size 48-55"